This week I’ve seen and reviewed two youth ensemble theater productions. I did that with some trepidation because I didn’t want them to be dreadful. It’s one thing if an adult production is dreadful and I have to write a bad review. But I really didn’t want to write a bad review when teenagers are involved. It turned out happily because both productions are outstanding, and in totally different ways. 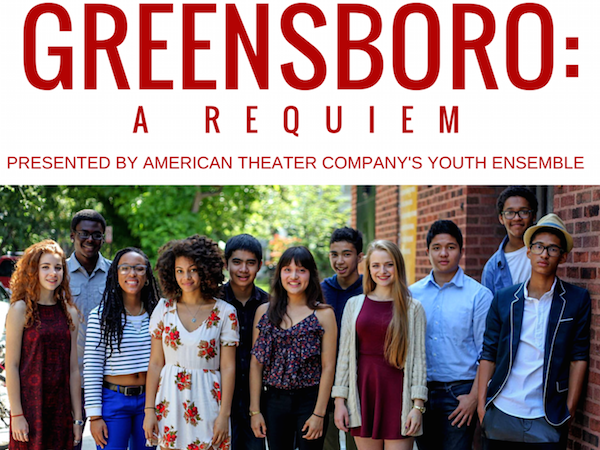 American Theater Company’s Greensboro: A Requiem is an example of the serious, documentary theater created by ATC’s late lamented artist director, P.J. Paparelli. This youth ensemble production presents a play by Emily Mann, which tells the story of a 1979 event in which five protestors were murdered by members of the Ku Klux Klan and the American Nazi party. Albany Park Theater Project’s Feast, originally mounted in 2010, is a lively, colorful series of scenarios about food in Chicago’s many immigrant communities, presented by a multiethnic group of 25 performers of high school age. Five just finished middle school and four will go on to college in the fall. Both productions involve the young performers doing additional research to update or recreate the stories (in the case of Feast) or to travel to the scene of the event to interview participants and survivors. In each case, the research served to deepen the actors’ understanding of the issues portrayed in their productions. Greensboro: A Requiem uses verbatim text from interviews, court transcripts and other documents to describe what happened on November 3, 1979, in the North Carolina city. The Communist Workers Party organized a group of mostly black textile workers to protest the Ku Klux Klan, which was then growing in influence. The protesters had a police permit for their march, but somehow the police conveniently managed to be out to lunch at the time of the march. A caravan of cars loaded with Klan and Nazi party members attacked the marchers and killed five of them. The 11 Chicago Public High School juniors and seniors do an excellent job of creating the mood and portraying what has become known as the Greensboro massacre and its aftermath. Read about their production in my review here. You can also read about the ensemble’s Kickstarter campaign that raised money for their travel to Greensboro. This show runs through August 2 at American Theater Company, 1909 W. Byron. Tickets are free, but reservations are suggested (and a $25 donation will be requested). Feast is a much less somber production, but underlying the joy of shopping (with a LINK card), cooking, eating and dancing are the real stories of the scarcity of food and its importance in tying the immigrant community to its home traditions. And of course food plays a glorious role in life and in family celebrations. See my review. Feast continues in the Goodman’s Owen Theatre through August 16. The circular stage with a runway on each end is a perfect setting for the production. Music and costuming complete an authentic picture of the lives of the many immigrant communities represented. Both of these productions provide an excellent and thought-provoking evening of theater. They will fill you with optimism about the future of Chicago and American theater.